The Healing Wars: Best. Day. Evah. The most amazing thing happened to me Saturday. I went to Ally Carter's book signing, as I took my place in the crowd, a woman walks up to me and asks, "Are you Janice Hardy?" 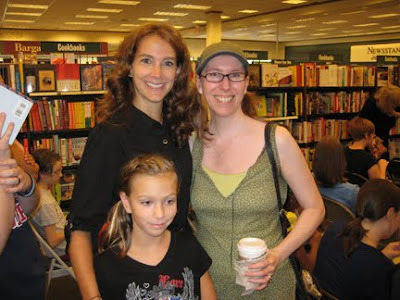 That's me, Nicole, and her daughter at Barnes & Noble. This was a first for me, and I think Nicole must have attended the Gallagher Academy herself to have recognized me at all from my photo on my website. How she picked me out of a crowd I have no idea, but it's a thrill I'll keep with me always. I'm still smiling over it. Of course, hearing Ally Carter and Lauren Myracle speak was awesome too. I've read all of Ally's stuff, but I just bought Lauren's book, Bliss, and I'm looking forward to reading it. Me and Ally Carter. (more excited squeals). 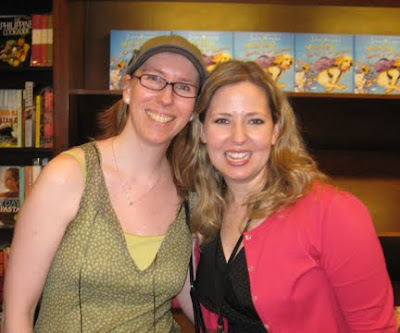 She was as nice and funny as she sounds on her blog. What a great day. Thanks, Nicole, for giving me a fantastic memory. My resume continues to grow: writer, publicist, resident spy. It was a thrill to meet you as well! I plan on bringing as many friendly faces as I possibly can. Are We Really a Month Out?